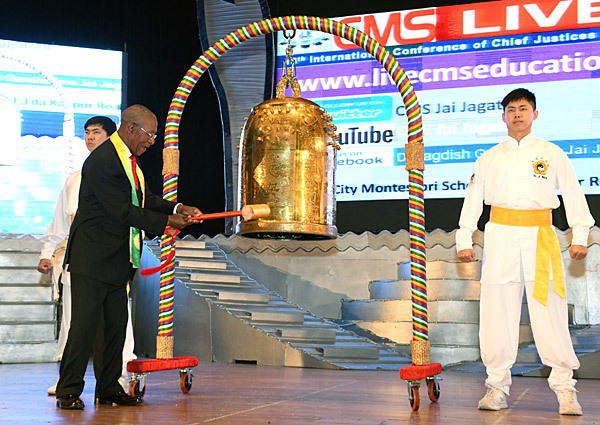 The ceremony of ringing the Bell of World Peace and Love was held during the opening of the 18th International Conference of Chief Justices of the World. Today the world is fast-changing, and a crisis can be triggered at any time. With natural and man-made disasters, terrorist attacks, and conflicts occurring frequently, nations across the planet need to work together to promote love and peace. To unite the world for a better future, the 18th International Conference of Chief Justices of the World in 2017 was held in India on November 8-14, and heads of state and government, chief justices, judges, lawyers, and other members of the legal communities from 60 countries arrived in Lucknow, India on Nov. 10 and were warmly welcomed. 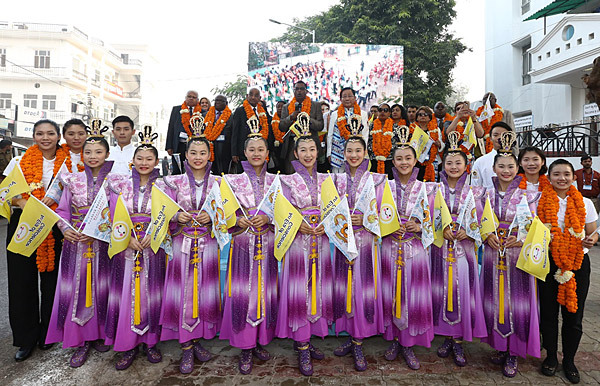 During the opening ceremony of the event on November 11, in particular, there was a ceremony of ringing the Bell of World Peace and Love, hosted by Dr. Hong, Tao-Tze, president of the Federation of World Peace and Love (FOWPAL) and Zhang-men-ren of Tai Ji Men. Six important leaders rang the Bell and made peace wishes, including the vice president of Guyana, a former prime minister of Lesotho, the speaker of the National Assembly of Mauritius, the speaker of the Parliament of Ghana, a former chief minister of Sri Lank's Sabaragamuwa Province, and a judge of the International Criminal Court in the Netherlands. Mr. Khemraj Ramjattan, vice president of Guyana, made the wish: "Peace, security, and happiness." 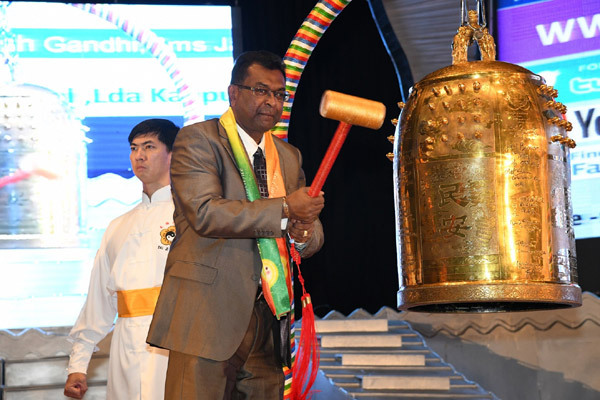 Mr. Khemraj Ramjattan, vice president of Guyana, rang the Bell of World Peace and Love and made the wish: "Peace, security, and happiness." Former prime minister of Lesotho, Dr. Pakalitha B. Mosisili, made a wish for peace: "May peace grow, flourish and affect each heart and all nations!" Speaker of the National Assembly of Mauritius, Mrs. Santi Bai Hanoomanjee stated, "May the world be united for peace in the interest of our future generations!!!" Speaker of the Parliament of Ghana, Rt. Professor Aaron Michael Oquaye stated, "Peace is the essence of humankind." Mr. Justice Eboe-Osuji, judge of the International Criminal Court in the Netherlands, stated, "I wish for a world in which there is no war and violence against humanity--in whole world or in any of its parts." Dr. Hong, Tao-Tze has led the cultural goodwill delegation to promote love and peace around the world for years. On many of their journeys, the delegates carried the 240-kilo "Bell of World Peace and Love" with them, and heads of state and government were invited to ring the Bell and make peace wishes. And hope that the sound of the Bell will reverberate throughout the world. Through the bell-ringing ceremonies, consolidate global leaders' wishes for love and peace and hopes that the leaders will bring the good and beautiful energy back to their countries. The Bell of World Peace and Love visited India for the fourth time this year. To date, there have been 308 bell-ringers from 100 countries, including 38 heads of state and government, 7 Nobel Peace Prize laureates, a winner of Nobel Prize in Physics, and a number of UN ambassadors. Many of them have put their peaceful wishes into actions. They used their wisdom to resolve conflicts and even prevented wars, and their peace endeavors have received a lot of international praise. Dr. Pakalitha B. Mosisili, former prime minister of Lesotho made a peace wish, "May peace grow, flourish and affect each heart and all nations!" Dr. Hong, Tao-Tze mentioned in his speech, "Global village is not merely a concept. For example, pollution and climate change are real and happening right now. The effects are already impacting everyone on the planet. . . . The global issues facing the humanity today requires ‘global governance.' Global governance is a process of cooperative management of the planet that brings governments, multilateral public agencies, and civil societies together, and it must span national and sectoral boundaries and interests in order to achieve our common goals." He also emphasized the importance of conscience, education, and culture and said, "Virtues of conscience such as courage, goodness, and compassion are shaped over a lifetime by education. Good culture leads to quality education which brings sound economy, and the culture based on conscience should be fostered by education." The vice president of Guyana, Mr. Khemraj Ramjattan felt very proud to be part of the bell-ringing ceremony and to have shared his message about the significance of peace, security, and happiness. He said that ringing the bell was "ceremonially and symbolically trying to ring in the new message, the message of peace." He continued to say, "We want citizens of the world to advocate more of the right things, like a global authority that would make laws and enforce laws." He also encouraged people to do what is right, starting with small things in their daily lives, like "ensuring our kids are taken care of, that we do not destroy the environment, that we be good and kind people." He believes that things like good parenting and good educational values for kids all help make our world a better place. Chief justices, lawyers, important members of the legal communities from all over the world, and swordswomen from Tai Ji Men were marching for world peace. An Ecuadorian attorney, Mr. Pablo Benjamín Aguirre Suárez praised Dr. Hong for being a humanitarian and agreed very much with Dr. Hong's concept of "One World." Suárez said that individuals and countries are constantly finding balance. We need to discard our prejudices about politics and self-interests, learn from others with a sincere heart, and connect with the rest of the world, added Suárez. 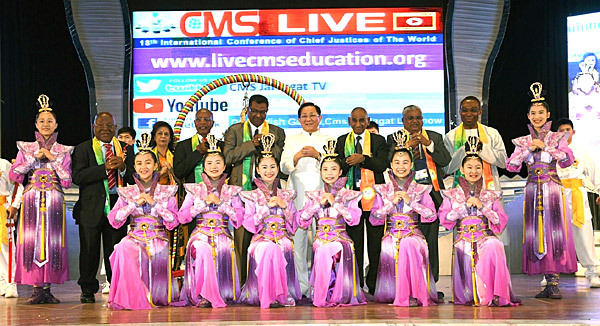 The Conference kicked off with the colorful "World Unity March" on the 11th as thousands of CMS teachers and students, chief justices, lawyers, and important members of the legal communities from all over the world joined the parade, conveying the message of love and peace. A group of international FOWPAL volunteers, waving the flags of the movement of An Era of Conscience, and Tai Ji Men members dressed as swordswomen also participated in the march and instantly drew people's attention. The CMS students marched while holding banners with slogans, such as "World Peace," "We Are One World," and "Unity," expressing humanity's common aspiration for world peace.